Fiber-reinforced concrete is concrete that uses other materials mixed in with the still liquid cement to reinforce the concrete structure. These fibers help make the concrete stronger and more resistant to temperature extremes. They also improve the concrete's water resistance. There are four types of fiber-reinforced concrete: steel fiber, glass fiber, synthetic fiber and natural fiber reinforced concrete. Steel fiber-reinforced concrete is basically a cheaper and easier to use form of rebar reinforced concrete. Rebar reinforced concrete uses steel bars that are laid within the liquid cement, which requires a great deal of preparation work but make for a much stronger concrete. 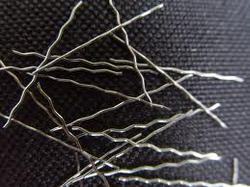 Steel fiber-reinforced concrete uses thin steel wires mixed in with the cement. This imparts the concrete with greater structural strength, reduces cracking and helps protect against extreme cold. Steel fiber is often used in conjunction with rebar or one of the other fiber types. Glass fiber-reinforced concrete uses fiberglass, much like you would find in fiberglass insulation, to reinforce the concrete. The glass fiber helps insulate the concrete in addition to making it stronger. Glass fiber also helps prevent the concrete from cracking over time due to mechanical or thermal stress. In addition, the glass fiber does not interfere with radio signals like the steel fiber reinforcement does. Synthetic fiber-reinforced concrete uses plastic and nylon fibers to improve the concrete's strength. In addition, the synthetic fibers have a number of benefits over the other fibers. While they are not as strong as steel, they do help improve the cement pumpability by keeping it from sticking in the pipes. The synthetic fibers do not expand in heat or contract in the cold which helps prevent cracking. Finally, synthetic fibers help keep the concrete from spalling during impacts or fires. Historically, fiber-reinforced concrete has used natural fibers, such as hay or hair. While these fibers enhance the strength of concrete they can also make it weaker if too much is used. In addition, if the natural fibers are rotting while being mixed, then the rot can continue even while in the concrete. This eventually leads to the concrete crumbling from the inside which is why natural fibers are no longer used in construction. Blends of both steel and polymeric fibers are often used in construction projects in order to combine the benefits of both products; structural improvements provided by steel fibers and the resistance to explosive spalling and plastic shrinkage improvements provided by polymeric fibers. In certain specific circumstances, steel fiber can entirely replace traditional steel reinforcement bar in reinforced concrete. This is most common in industrial flooring but also in some other precasting applications. Typically, these are corroborated with laboratory testing to confirm performance requirements are met. Care should be taken to ensure that local design code requirements are also met which may impose minimum quantities of steel reinforcement within the concrete. There are increasing numbers of tunnelling projects using precast lining segments reinforced only with steel fibers.